Navigation systems get us from A to B reliably and without difficulty. The coordinates do not need to be accurate to the nearest centimetre in order for us to get directions, but this could be a problem in the not-too-distant future, namely when cars are autonomous and driverless, and every centimetre is vital. Hartmut Runge and his team from the German Aerospace Center (DLR) have developed DriveMark – a project with high market potential that was funded by the Helmholtz Validation Fund. In the following interview, Runge explains how the technology has revolutionised digital maps. It has never been so simple to get from A to B. Yet our current navigation systems are no longer sufficient. Why not? We’ve all experienced the following situation: the GPS is late in telling us that we have to turn right in 20 metres and we narrowly miss the exit. Modern-day navigation systems have an accuracy of just eight to ten metres. This can be annoying, but it generally makes no difference. Their only purpose at the moment is to get us to our destination. In the future, however, there will be more and more cars that are not driven by human hands and that navigate autonomously. This requires very accurate maps. With DriveMark we have developed a technology that can provide the data required to deliver such accuracy. How do you see the future of driving? It will become easier for drivers. Assistance systems are most useful for monotonous journeys, like driving on the motorway at night, for example. They make driving safer. After all, the majority of accidents are not caused by the technology, but by the person at the wheel. Think of tired drivers who veer off the road, for instance. Driver assistance systems can prevent this by automatically counteracting the mistake. We will eventually get to the point where drivers can completely switch to autopilot. Car manufacturers are certain that these systems will be here faster than we realise. Will cars then be navigating their way through traffic with the help of numerous sensors and cameras? Cars can indeed navigate through space with the help of cameras, and they would somehow reach their destination with the integrated technology. But just imagine if the driver assistance system is supposed to overtake another car on a country road. 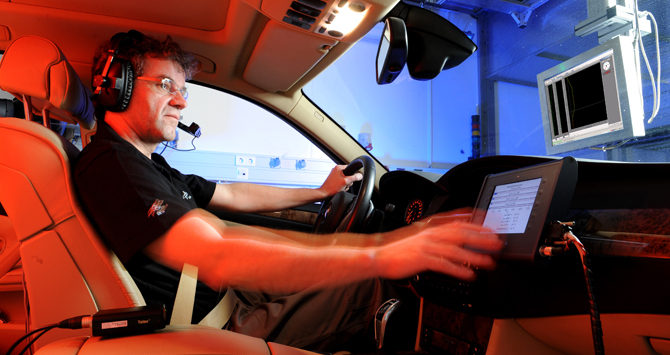 The car needs to know the exact course of the road in order to be able to calculate the manoeuvre accurately. Several automotive manufacturers have already put out videos showing that autonomous driving is already technically possible. What gaps are you planning to fill with DriveMark? The test routes in these videos are laboriously measured out beforehand. It takes a long time, costs a lot of money, and the vehicle can only move within the marked-out area. We want to create maps via satellite that are highly accurate over very large areas and thus make the technology suitable for mass use. How exactly do you intend to achieve that? We produce satellite images whereby every pixel on the image is provided with its exact coordinates. Radar satellites can capture an area of 40 x 60 km in just a few seconds. The image is then automatically analysed. Cartographers can use the coordinates to improve their maps. Consider that overtaking manoeuvre once more: with the new data, the car will know long in advance precisely where the continuous line ends and when overtaking is allowed again. What if the satellite navigation fails due to a poor signal? A situation can always arise where the satellite navigation system does not work seamlessly, but our DriveMark technology also has all the necessary features for navigation via landmarks. The principle is as old as the hills; in the past, prominent points, such as mountain summits or church towers, would be used for orientation. We are automating this kind of navigation, while also making it much more precise. We can precisely measure landmarks, such as street signs, and feed these into the information in the maps. If the car’s cameras have these landmarks in their sights, the car’s exact position can be determined without using satellites. This increases safety, because two navigation systems are in operation. If there are inconsistencies between the two systems, the driver will be notified in good time and can assume manual control. How precise will the maps ultimately be? We are currently only in the initial stages of development and cannot promise any concrete figures. Maps need to have an accuracy of around ten centimetres for autonomous driving. We have so far been successful in mapping individual points with an accuracy of two centimetres. But even if the technology were ultimately only capable of offering an accuracy of 20 centimetres over a large area, it would be a significant improvement on the maps currently available. Looking at DriveMark’s place in the history of navigation, would you class the project as evolution or revolution? Both. People have always used maps to navigate, but they have got better over time thanks to new and improved measuring methods. In this respect, our even more accurate maps would be part of the evolution of navigation. At the same time, however, we want to be the first to develop maps that are no longer designed to help people with orientation, but rather that allow a computer-controlled system to navigate independently, without humans having to intervene. In this sense, it is completely revolutionary. In which areas can the DriveMark technology be used? The system can theoretically be used anywhere with precise locational information. It could be used in land surveying, for example. Surveyors currently use GPS receivers to measure the land. This technology would allow them to do it via remote sensing, without having to set foot on the plot of land. The maps also make it very simple to update and optimise existing datasets. That means many companies are likely to be interested in the technology. When can we expect to see the new maps? We know that our system works. We have proved this in successful tests using individual objects. The next step is to evaluate the possibility of using the technology over a large area. We hope there will be a breakthrough in the next few years. Autonomous cars still sound like science fiction to you? We spoke to Raúl Rojas of the Freie Universität Berlin, whose team played a key role in the development of driverless, autonomous cars. You can read the interview here. The Helmholtz Validation Fund (HVF), which is financed by funds from the Helmholtz President’s Initiative and Networking Fund, aims to bridge gaps between scientific findings and their commercial applications, and between public research and private investment. In creating the Validation Fund, the Helmholtz Association wants to minimise gaps in financing and ease the transition from idea to application.